Entry fees of monuments, horse ride etc. Expense of personal nature like tipping, laundry, telephone / fax calls, alcoholic beverages, camera / video camera fee at monuments, medical expenses, airport departure tax etc. Pick up from Chandigarh railway station/ Air port and drive to Shimla, and check in hotel. After Breakfast Excursion to Kufri. In-route green valley covered with Deodar trees, charbra (wildflower hall), Kufri is famous for its Himalayan National Park, Pony and Yak Ride and One can see the endless Himalayan Panorama, after lunch sightseeing of Shimla city, Vice Regal Lodge Heritage place and apart from the majestic building, it has well maintained lawns, Annadale the most picturesque place ,bottom of the city, Mall Road in Shimla, is a place which cannot be left untouched by any visitor and B/H. In morning check out from hotel & drive to Manali enroute Pandoh Dam on Beas River, Hanogi Mata Temple on the bank of Beas river , shopping at Kullu. Kullu is world famous for its handicrafts items, River rafting on beas river ( White water rafting can be organized)and Manali stay at hotel. Excursion to Rohtang Pass. (up to possible) Situated at an altitude of 3979 mtrs above sea level and 51 kms from Manali is the mighty Rohtang Pass - the gateway to Lahaul-Spiti valley. It affords a wide panoramic view of the mountains Rohtang is another adventure tourist site where it can be cold even on a summer day. Winds blow at furious pace,The visit to Manali is incomplete if you do not go to Rohtang Pass, and B/H. 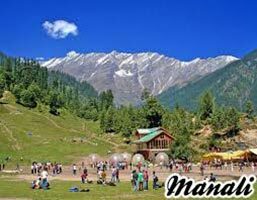 Full day sightseeing of Manali, Hidimba Temple, It is located on a Deodar covered hill in Manali, It is an ancient cave temple, Built over a huge rock, the sanctum is covered by three tiered roof of wooden planks, Tibetan monastery The colorful monastery is famous for its carpet-weaving unit where the residents, the immigrants from Tibet, produce handicrafts of various kinds that attract the tourists towards it, Vashisht, a small village located on the left bank of river Beas towards Rohtang pass is worth a visit. It is renowned for its hot springs and temples. Naggar , Naggar was the former capital of Kullu, Naggar - an ancient town commands extensive views, especially to the North West of the valley. Today this ancient and beautiful Palace is a popular tourist spot. and evening at explore the local market. B/H. In the morning Check out from hotel & drive to Kalka, and drop railway station, Happy ending of tour. Congestion charges to Rohtang Pass. 15 April, 2015 To 15 July, 2015.